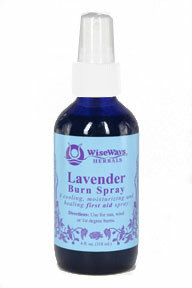 A cooling, moisturizing and healing First Aid spray. Directions: Use after exposure to sun or wind, or for first degree burns. Keep a bottle in the kitchen. Contains: Apple Cider Vinegar Extracts of Organic Marshmallow, Calendula, Echinacea & St. JohnÕs Wort, Olive, Aloe Vera & Vitamin E Oils, Grapefruit Seed Extract, Essential Oils of Lavender, Chamomile, Geranium, Ho Wood & Evening Primrose.